How did Microsoft create assemblies that have circular references? How Microsoft created these assemblies is a mystery to me. Is a special compilation process required to allow this? I imagine something interesting is going on here. I can only tell how the Mono Project does this. The theorem is quite simple, though it gives a code mess. They first compile System.Configuration.dll, without the part needing the reference to System.Xml.dll. After this, they compile System.Xml.dll the normal way. Now comes the magic. 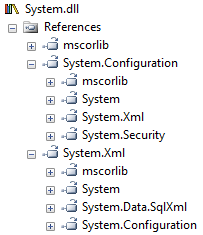 They recompile System.configuration.dll, with the part needing the reference to System.Xml.dll. Now there's a successful compilation with the circular reference. A is compiled without the code needing B and the reference to B.
RBarryYoung and Dykam are onto something. Microsoft uses internal tool which uses ILDASM to disassemble assemblies, strip all internal/private stuff and method bodies and recompile IL again (using ILASM) into what is called 'dehydrated assembly' or metadata assembly. This is done every time public interface of assembly is changed. During the build, metadata assemblies are used instead of real ones. That way cycle is broken. It can be done the way Dykam described but Visual Studio blocks you from doing it. You'll have to use the command-line compiler csc.exe directly. Create 2 Class Library projects "ClassLibrary1" & "ClassLibrary2". From ClassLibrary1 add a reference to ClassLibrary2 by browsing to the dll created in step 3. From ClassLibrary2 add a reference to ClassLibrary1 by browsing to the dll created in step 3. So this is how you do it. But seriously... Don't you EVER do it in a real project! If you do, Santa wont bring you any presents this year. I guess it could be done by starting with an acyclic set of assemblies and using ILMerge to then coalesce the smaller assemblies into logically related groups. Well, I've never done it on Windows, but I have done it on a lot of the compile-link-rtl environments that served as the practical progenitors for it. What you do is first make stub "targets" without the cross-references then link, then add the circular references, then re-link. The linkers generally do not care about circular refs or following ref chains, they only care about being able to resolve each reference on it's own. Link A without any refs to B. Link B with refs to A. Link A, adding in the refs to B.
Dykam makes a good point, It's compile, not link in .Net, but the principle remains the same: Make your cross-referenced sources, with their exported entry points, but with all but one of them having their own references to the others stubbed out. Build them like that. Then, unstub the external references and rebuild them. This should work even without any special tools, in fact, this approach has worked on every operating system that I have ever tried it on (about 6 of them). Though obviously something that automates it would be a big help. One possible approach is to use conditional compilation (#if) to first compile a System.dll that doesn't depend on those other assemblies, then compile the other assemblies, and at last recompile System.dll to include the parts depending on Xml and Configuration. Technically, it's possible that these were not compiled at all, and assembled by hand. These are low level libraries, after all. Not the answer you're looking for? Browse other questions tagged .net assemblies circular-reference bcl or ask your own question. Does the .NET CLR have a circular dependency? How do I create and use a .NET metadata-only 'Reference Assembly'? How can System.Object use sub-classes as its return types? How to detect circular references between assemblies in a .NET solution? Why are three properties in DbParameterCollection abstract in reference assemblies but virtual otherwise?